Savoy Club Rewards Program: Collection and redemption of points are available for individuals as stated in the SAVOY Club Rewards Terms & Conditions available at http://www.savoy-sharm.com/savoy-club/or by calling the SAVOY Club service center (+2-069) 3602500 /2. 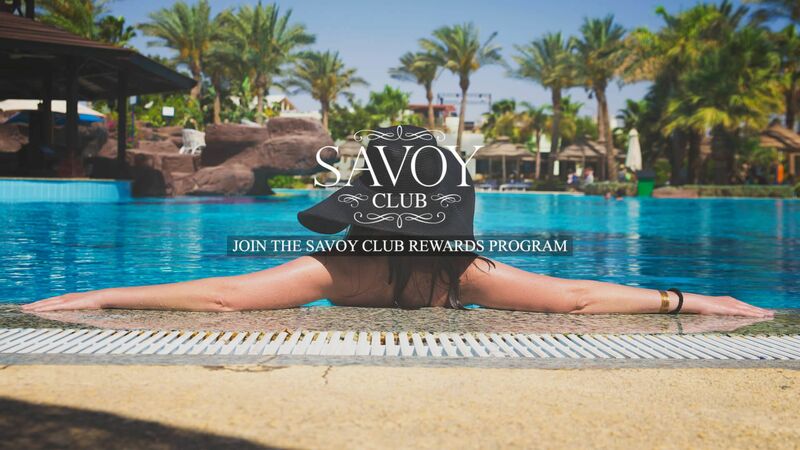 By enrolling in the SAVOY Club rewards program, Members agree to the Terms & Conditions of the program. Benefits related to the program may change according to the SAVOY Group management’s discretion without prior notification. The SAVOY Club Rewards Program and benefits are offered at the discretion of SAVOY Group Hotels & Resorts. The management reserves the right to suspend or cancel the program and Savoy Club shall have no obligation to offer a replacement program. SAVOY Group Hotels & Resorts has the right to modify, suspend, change, limit or cancel the program regulations, benefit levels, conditions and rewards even in the event such changes may affect the value of the points or rewards heretofore accumulated. Savoy Club will use reasonable efforts to advise Members of changes to the Terms & Conditions in advance, but shall not be held liable in any way for any failure to do so. It is the responsibility of Members to read, understand and remain knowledgeable of all of the Terms & Conditions inclusive of any amendments thereto. Members’ SAVOY Club membership account will be closed at the management’s discretion if it is inactive for 3 years. A Member’s account will be deemed inactive if such Member has not stayed a qualifying night at Savoy Group Hotels and Resorts during the previous 3 years. SAVOY Group Hotels & Resorts reserves the right to cancel Membership if the Member’s membership is being misused, bills are unpaid, or there are program irregularities, fraud or violation of the program’s Terms & Conditions. In order to benefit from the Program, Members must indicate their Membership number when making a reservation and present the card when checking in at the hotel. The Member must comply with these conditions to benefit from the program. Members may receive a monthly newsletter and quarterly statement of account by providing the SAVOY Club with an Email address Should Members make a written request it should be made in this application or by calling SAVOY Club Service Centre. Members of the SAVOY Club must be at least 18 years of age. This program is invalid and/or the points acquired voided where prohibited or restricted by law. Hotel guests can join the SAVOY Club by completing the SAVOY Club enrolment form available at the Reception Desk or the Guest Relations Desk and returning it to the Front Desk. The Savoy Club Card will be ready at Savoy Club Desk within 24 form enrolment date at one of Savoy Group hotels or upon the member request while staying at one of Savoy Group hotels. Points accumulate depending on the accommodation level and choice of room in the Savoy, Royal Savoy and Sierra hotels. Points' accumulation is per room (not per person) based on room type and meal plan at qualified room rates. Savoy Club Members may earn points for stayed nights from the date of their enrolment in the Savoy Club program. Points will not be earned for stays prior to the date of enrolment. SAVOY Club award points will expire after 12 months from the date that award points earned. Your right to redeem your points may end 3 month after point’s expiration date. Only one Member per checked-in room may receive Award Points for a stay. Members may earn Award Points for the Member and one other room (a maximum of 2 paid rooms) on condition the rooms are checked in under the Member's name, that the Member stays in one of the designated rooms and the second room is occupied by at least one member of his or her family and that the Member pays the charges related to the room. Points' accumulation will be credited after 4 days from the departure date and the Member receives notification of the total points earned during their stay/s. A Member may redeem Savoy Club points once Member points have been credited to a Member’s account. SAVOY Club only awards Members for stays at SAVOY Group Hotels & Resorts through the benefits related to the program. SAVOY Club does not award meeting, incentive and conference organizers for holding events or catering at SAVOY Group Hotels & Resorts and other special rates, discounted rates or free rates. SAVOY Club points will automatically be voided when refunds are made. Members may resume accumulating points when they become eligible. SAVOY Club points may only be accrued by an individual member (such as for a room or meal). Points can only be transferred to one family member or room partner in the same reserved room and cannot be transferred between non-eligible members. Eligible rates give Members the right to earn points. Eligible rates include business, leisure and individual reservations not including complimentary rates or free rates. Extra 10% Award points are credited each time direct room booking is applied to reserved room types. Awards are subject to capacity regulations, which may limit the availability of products and services offered by SAVOY Group Hotels. Redemption of Awards may also be limited during certain times of the year. All Awards are subject to availability throughout the year SAVOY Group Hotels & Resorts reserve the right to decline redemption at any time. A reward request form is available at hotel reception desk or Guest relation desk. Redeemed points and rewards are not refundable. SAVOY Club points’ redemption qualifies for a free night’s stay only when the room reservation is made through SAVOY Group Hotels & Resorts at least 14 days in advance, stating that the reservation qualifies for redemption. Free night stays are subject to hotel availability and cannot be made through 3rd party reservation systems. SAVOY Club points’ redemption for a free stay is dependent on availability within the allocation for redeemed rooms and confirmation. SAVOY Club points’ redemption for a free stay is on bed and breakfast basis at SAVOY & Royal Savoy and on an all-inclusive basis at the Sierra. SAVOY Club points’ redemption for a free night’s stay must not exceed 35% of total consecutive eligible reserved nights. Also free night’s stay must be the last night(s) of consecutive eligible reserved nights. Room upgrade may be subject to hotel availability. To redeem your points for room upgrade you must make your reservation and send the upgrade request in advance to savoyclub@savoy-sharm.com to ensure accommodation is available. May your available points not enough to cover your whole booked nights of room upgrade– extra night(s) for room upgrade is requested will be subject to a supplementary charge. Meal upgrade reward redemption points per person per night per level. May your available points not enough to cover your whole booked nights of meal upgrade – extra night(s) for meal upgrade is requested will be to a supplementary charge. Half Board Dine Around, the dinner at any à la carte restaurant. When Hotel voucher is requested and confirmed by email, the Hotel voucher will be ready upon guest arrival (by calling 8080 from 9 am to 18 pm) to one of Savoy Group hotels. The hotel voucher reward will be ready less than 48 hours from the date of the reward requested – after reviewing the availability and capacity regulation of requested reward. SAVOY Club points’ redemption for extra meal or free Spa session is dependent on the hotel’s overall allocation for the number of dinners or Spa sessions and on confirmation. SAVOY Group Hotels may at its discretion designate the restaurants assigned for the free “dinner at one of the restaurants in SOHO Square or SAVOY” awards. Guests are entitled to one set menu (one item from each menu course) excluding all beverages for the complimentary dinner. Some menu items will be subject to a supplementary charge. All beverages are excluded for the complimentary lunch at main buffet restaurant. SAVOY Club points redeemed in the form of free Ice Skating or Bowling do not include additional free use by children. Hotel Voucher rewards may be used only by Members with eligible reserved nights at one of the Savoy Group Hotels. Hotel voucher will be rendered null and void if listed or advertised for sale or auction on the Internet, in newspapers and magazines, or other similar communications. SAVOY Club reserves the right to deny any certificates it believes have been resold, transferred or conveyed contrary to this provision. Members may nominate from a list of Members entitled to their points for hotel vouchers with written and signed request for nominated members. Maximum 5 nominated members. Hotel Vouchers valid for three months from the date of issuing the award voucher. Early check in and late check-out may be subject to hotel availability. Late check-out is subject to reception confirmation on departure day. To redeem your points for early check-in you must make your reservation and send your request in advance to savoyclub@savoy-sharm.com to ensure accommodation is available. Sign a reward request form during your stay at one of Savoy Group hotel. The hotel voucher reward will be ready within 48 hours from the date of submitting the reward request. Send a reward request by email is Recommended for free room nights, Room upgrade and early check in. Status Points determine eligibility for Blue, Gold and Platinum Membership levels. The number of status points determines the membership level for each qualifying night stayed per room type within the applicable time frame of 3 years. Status points accumulate depending on the accommodation level and choice of room in the Savoy, Royal Savoy and Sierra hotels. Status points' accumulation is per room (not per person) based on room type and meal plan at qualified room rates. New Membership begins at Savoy Club blue membership, “the entry-level tier”. Members are upgraded to the next level when Members accumulate the number of status points required for the next status level on the Savoy Club Program within the applicable time frame of 3 years. Credit for Qualifying Nights will only be registered on a Member’s membership account once full payment for such Qualifying Nights has been received. It can take up to 4 days after check-out before Qualifying Nights are credited and registered on the Member’s membership account and the membership level is upgraded. In order to remain at any given tier level, Members must re-qualify for such tier level within 3 years. To earn GOLD Membership, a Member must have 2,000 status points for qualifying Nights per room type at Savoy Group Hotels. And to earn Platinum Membership, a Member must have 3,500 status points for qualifying Nights per room type at Savoy Group Hotels. Only one Member per checked-in room can receive status points during a stay. Status points are earned for the Member and one other room (a maximum total of 2 paid rooms) on the condition that said rooms are checked-in under the Member's name, that the member stays in one of the rooms, that the second room is occupied by at least one member of his or her family and that the Member personally pays the charges related to the room. Extra 10% status points are applied when Members make direct room booking on reserved room types. Status points are not transferable between members. Room upgrades benefit; late check-out and early check-in are subject to availability. Discount on published rate cannot be combined with any other discount rates. Savoy Club Members can get the Savoy Club discount for the Member and one other room on condition the rooms are checked in under the Member's name, that the Member stays in one of the designated rooms, and the other room is occupied by at least one member of his or her family (only children, parents, brothers) and that the Member pays the charges related to the room. Free Internet connection is unlimited for Savoy Club’s card holder only. Free Soft Mini bar once per stay. Member must present his/her Gold or Platinum card at SOHO or Savoy Bars to get the discount on beverages checks. Same day guaranteed reservation will be up to 18:00 hours on arrival date.